Inside: Looking for an app to help keep track of your shopping lists and your spending? There are two great options available right now. It is a never ending battle when it is time to go grocery shopping. You need to remember everything, not lose your list, stay in your budget, and didn’t you have a coupon? With all the budgeting tools available, you would think there is a good grocery budget app out there, somewhere. I have tried several tools over the years. There are some great apps out there that can help make lists, but few that help you stay on track when spending money on groceries. When looking for apps, I look for certain features, and a grocery app isn’t any different. I like to be able to sync my list across devices and access the lists on my laptop. It is also important to have the ability to share my list with other family members. If one of us swings by the drugstore, we can check the list, pick up what we need, and cross it off once purchased. It is also important to be able to easily re-enter frequently purchased items and keep a running total of costs. Price entry is the one feature that many list apps and even grocery list apps lack. Believe it or not, I have found some do exist and that meet my criteria. Best of all, they both have free options on both iOS and Android! 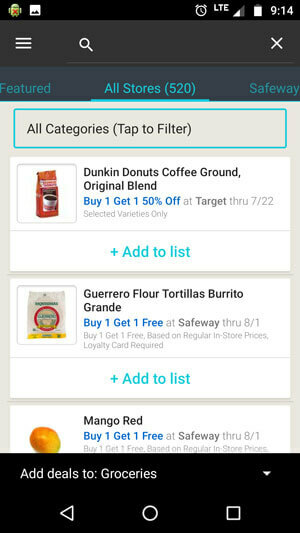 Grocery iQ is an app owned by Coupons.com. As such, if you have a Coupons.com account, you can use the same login for the app. This app is made with shopping in mind. You can create multiple lists and share them with someone else using the same account because the lists automatically sync across devices. They also have a web interface for those that prefer typing using a keyboard rather than on a phone. When creating your lists, you can organize items by aisle, add quantities needed and size. Need 2 lemons or 3 pounds of russet potatoes? They’ve got you covered. 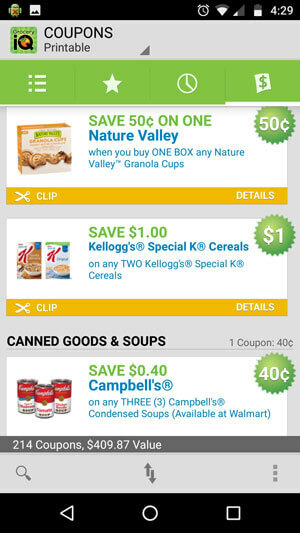 Of course, being part of the Coupons.com family, you can clip coupons in the app to print. You do this by searching for coupons, then “clip” them and email them to yourself for printing. Besides keeping you organized and your shopping list easily accessible, Grocery iQ helps you stay within your budget by showing how much the items on your list should cost. This, of course, all depends on how accurate the prices you enter in the app are. The easiest way to enter prices is to save receipts and add the prices in when you are at home. To make creating lists easier, you can mark items as “favorites” so they are saved for easy access later without needing to re-enter information. You also have the option of scanning barcodes for easy item entry as well. 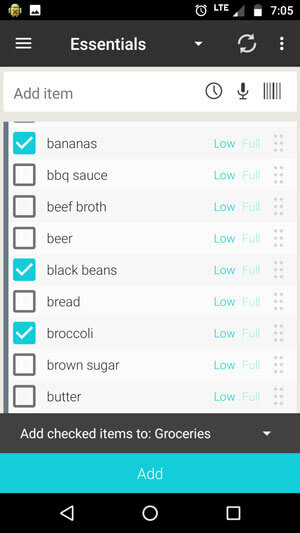 Full disclosure, Out of Milk is currently the list app I use on an almost daily basis. This app allows you to have multiple shopping lists so you can have separate lists for groceries, Target, the drug store, hardware store, and even a list for craft supplies. Best of all, you can selectively share lists by inviting friends through email. Let’s say you want to share the grocery list with your spouse but not your gift idea list. No problem! Your spouse can have his own account and lists and you can share and stay synced with those you choose to share. There are another set of lists for your pantry, where you can enter a list of items you have and make note of the supply level. Or, the way I use it is I keep lists of frequently purchased items so I can easily copy what we need to the weekly shopping list with a few taps. As with Grocery iQ, you can also scan barcodes for items. To top it all off, there are task lists you can create and set reminders. 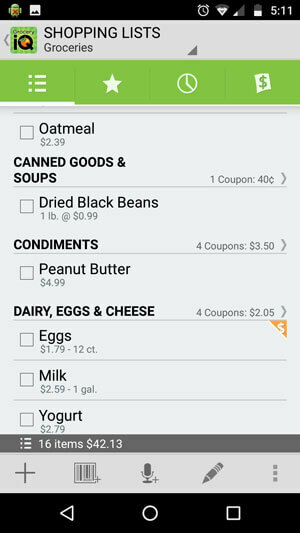 And, of course, to keep your grocery budget on track, you can include item prices, note if you have coupons, and check for deals at stores all from within the app. This allows you to see the likely total of your list purchases as well as a running total as you add items to your cart. There is even an option to add in your local sales tax. 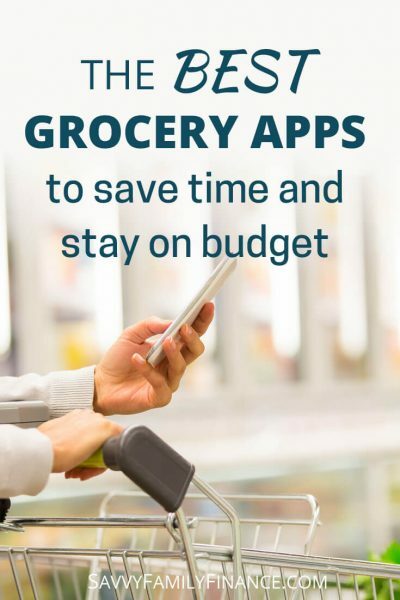 While there are a lot of great list making apps, and even apps that give you cash back on your shopping, these are two that are worth using when trying to track grocery spending. 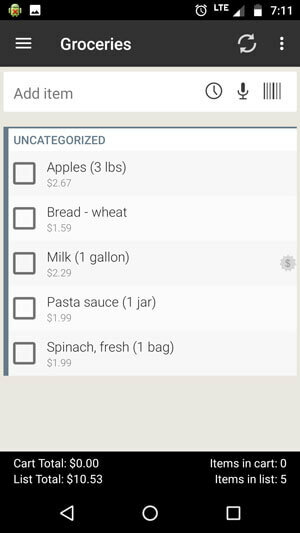 Do you use a grocery list app? What features are important to you?